Automate workflow, shares, health monitor, and website for Apple's Compressor. Is there a better alternative to Compressor Server? Is Compressor Server really the best app in Video category? 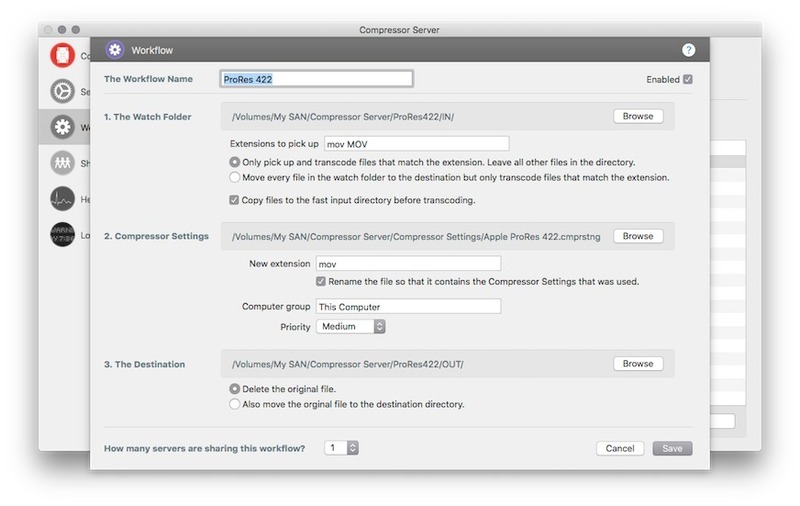 Will Compressor Server work good on macOS 10.13.4? Compressor Server let you automate workflow, mount shares, monitor app health, and generate a monitor-website for Apple's Compressor. Easily setup workflows based on a watch folder. Files placed within that watch folder are automatically sent to Compressor, transcoded, and placed in a given destination directory. For each workflow, you can select a unique Compressor setting, computer group, priority, etc. Added progress bars in the website! Compressor Server needs a rating. Be the first to rate this app and get the discussion started! A watch folder can also be on a share. Compressor Server can make sure that share is mounted. And if that share falls away Compressor Server will simply remount it. Regularly check the health of Compressor. If it suspects that Compressor isn't running properly anymore, it will automatically reset or repair Compressor. You can also use the Health Monitor on your cluster Macs so that they always keep responding, making sure your job always gets submitted and transcoded. Creates a website where you can easily monitor every file that's going through your workflows. You can see the status of files, and even their progress. Fail over and load balancing. Use as many Compressor Servers as you like in your environment to make sure it remains stable.